"Aaron and Paul in service will definitely take care of all your needs. They are truly helpful, informative, friendly people. Even though we had an issue they did right by us and corrected it without a problem and went the extra mile to do so. Also, Julie in apparel is always willing to help with all your clothing and accessory needs. She's very knowledgeable and helpful. While you are trying to find that perfect fit top, bottom, coat, sunglasses, whatever it may be, shes right there to give her advice and honest opinion. I've never felt like she was just "trying to make a sale" off of me." 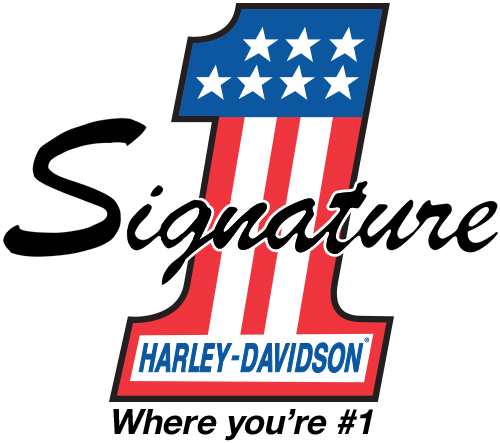 "This was about my 10th time going there and it's a great Harley Davidson Dealership. Its about 45 miles from where I live and I rather go there than to the Dealership that's 5 miles away from me." "...These boys saved me middle of nowhere came to get me immediately and stayed late to get me running again on my trip from chicago to New York. Great guys in service and knowledgeable give them business for sure. Amazing people thanks again fellas." "The guys at Signature are really chill dudes, good guys to work with. Rick, Donny, and Mark took really good care of me, certainly earned my business!" "Having bought many automobiles and motorcycles over the years, I have dealt with many dealers. I must say this was by far the best of any of the experiences that I have had. There are a number of good H-D dealers within an easy drive from my home in NE Ohio but the good people of Signature like Terry in sales and Jerry in finance and all of the people that they introduced me to in each of the other departments definitely made me feel that it was worth the drive. Thank you all." "If you want to shop or buy a bike the staff is very knowledgeable and can answer all your questions without them hovering over you. They will take your lead. I had a great experience and ended up buying my second bike from them. After I bought the bike I was introduced to staff from each department before I left with my new ride."